Another Summer gone, spent a lot of time driving my wheels of the 42 Coupe, but some progress on my V12 project. And the goal this year was to start the engine. And that I've done plenty off ;-). This is a tool I've made for the floor on the 42, but it came to good use when building a gas tank for the V12. The dimple will be the outlet for the gas. The tank will be a mirror of the Oil tank. Here I've "Photo shopped" my project with some wire wheels, and a radiator sort off.. I think it can be something nice. Here I've loaded my "car" ,to go to a small, boys meeting. Flatlanders Hot Rod Club arranged a small meeting a couple of miles from home, and asked me if i could come, and run my V12 a bit. At the place there was some nice tractors. Alex my grandson is testing the Allis Chalmer tractor. Four cylinders 6 litre Diesel engine! This is a landsverk wire digger machine is awesome. Its owned by Björn and a couple of his friend. After some digging and V12 listening , it was time for some burger's and some beer. Another Sunday this summer, there was some friends visiting my garage, to listen to the "monster". And i was more than willing to share the pleasure, of 27 litre V12, without headers. Enough with fun and games, back to work. I got a 6 mm steel plate for the gearbox mount. Had to cut out a hole for the PTO. 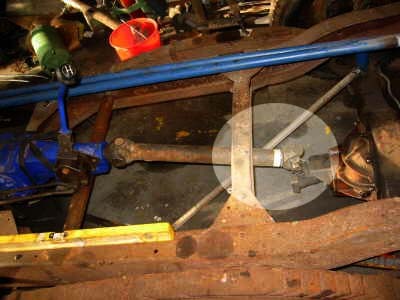 Then I clamped it to the gearbox. And drilled the appropriate holes. 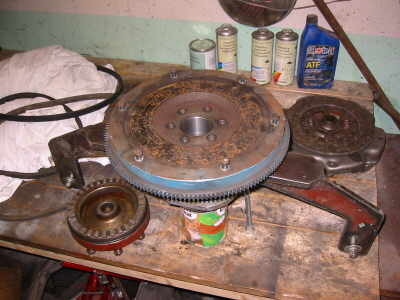 On the PTO i have mounted a Chevy flywheel. All the power is taken out thru this "Gear". First try to mount the gearbox. I had to cut of some parts of the PTO mount. After some fiddling i finally got it in. It looks like it was meant to be, Chevy meets Rolls Royce Merlin (Rover meteor). I also made a gearbox mount, things where looking good. I could almost see myself driving down the road. DISASTER When building the props haft, i found out that the angle between the gearbox and rear axle was to steep. And the props haft was to "short" for the angle. I mounted the engine flush with the upper side of the frame, it was easy that way ( i thought). After some days of depression i had to bite the apple and lower the engine four inches in the rear and two inches in the front. 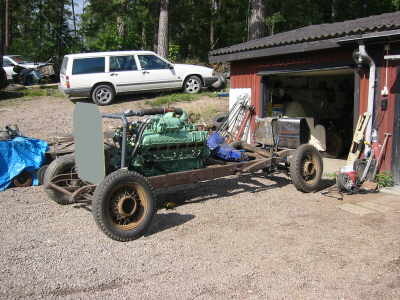 major work since the engine weights around 600 kilo. Now the props haft fits, the angle is quite step on this picture but i still have to rotate the rear axle upwards a bit, And that will improve the situation. Now the box sits lower in the frame, and that will make the manufacturing of the floor easier. Still have to build a new gearbox mount, and reroute the oil pipes. Its a bad picture but the engines sits lower now, and it looks a bit better. 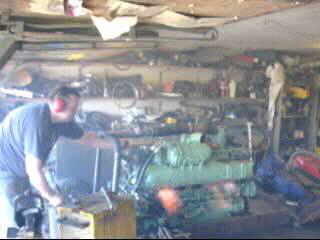 Here is a picture captured from a MPG movie taken on my first test start. By the way if you want to see the "movie" here is the link. 3.9 MB so it takes a while with a Modem.